Many people did not wait until the day after Thanksgiving to shop. 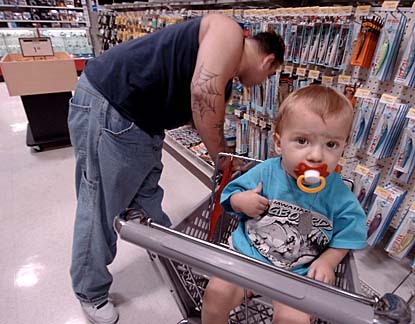 Above, Ken Soto mulled fishing supplies yesterday at Sports Authority on Ward Avenue while his son Darien Soto, 1, waited. Home Depot Inc., the No. 1 home-improvement chain, is offering $2,299 treadmills. Grocery chain Winn-Dixie is selling flat-screen televisions for $149.99. Kroger Co. and Petsmart Inc. are getting into the act, too. Retailers not usually associated with holiday shopping are stocking the aisles with merchandise such as electronics and toys, aiming for a larger share of the $219.9 billion the National Retail Federation estimates Americans will spend this season. Home Depot's first holiday catalog last year helped boost sales at existing stores by 7.6 percent, twice its annual sales gain, the company said. "In the past, we used to think that Black Friday -- the day after Thanksgiving -- was a holiday," Carol Tome, chief financial officer of Atlanta-based Home Depot, said. "We now understand it's a real retail opportunity." 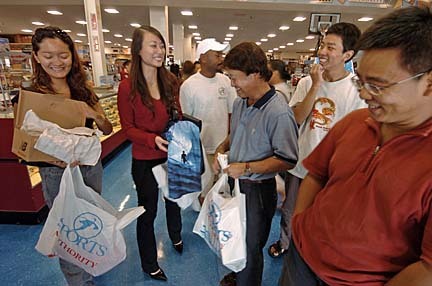 Nan Zhang, left, Sarah Zhu, George Wang, Vernon Ching and Terence Tu eyed their purchases at Sports Authority. Shoppers in 2003 spent $7.3 billion on Black Friday, which got its name because historically the day after Thanksgiving was when many retailers showed their first profit for the year. Last year it was also the biggest sales day of the year, according to the International Council of Shopping Centers, a retail industry group based in New York. Retailers derive 23 percent of annual revenue during the holiday season, according to the National Retail Federation. Home Depot is distributing more than 6 million holiday catalogs, 20 percent more than last year, said John Costello, executive vice president for merchandising and marketing. The retailer has added children's gifts such as $279 battery-powered John Deere lawn vehicles, $40 scooters and $50 Disney lamps. A survey of about 750 U.S. consumers by investment bank SG Cowen & Co. in New York found 61 percent planned to buy home-improvement products and tools as holiday gifts. The category wasn't included in the company's first survey last year. This "is shaping up as a home-oriented holiday," Costello said. Supermarkets such as Cincinnati-based Kroger, the No. 1 U.S. grocery-store operator, and Winn-Dixie are increasing offerings during the holidays of DVD players and TV sets to attract shoppers from Wal-Mart Stores Inc.
Winn-Dixie, the Jacksonville, Fla.-based grocer with stores in 12 U.S. states, posted sales declines for the last seven quarters. "We've already been experiencing very good sales" of holiday items, said Terry O'Neil, a Los Angeles-based spokesman for Kroger's Ralphs chain, which has more than 300 supermarkets in Southern California. "Our selection would rival any of the mass merchandisers out there." Albertson's Inc., the No. 2 U.S. grocery chain, has posted annual sales declines since 2000. It began selling Toys "R" Us Inc. products last year and some of the company's more than 2,400 stores set up Toys 'R' Us display sections. "Margins in the toy business are better than in lettuce and canned meat," said George Whalin, president of Retail Management Consultants in San Marcos, Calif. "I would think it's one of their highest-margin businesses." Grocers' nonfood items may not boost sales in the long run, said Gary Giblen, an analyst at C.L. King & Associates in New York. "All they're doing is hurting their price image," said Giblen. "Eighty percent of the time," prices on nonfood products aren't competitive, he said. Kroger spokesman Gary Rhodes didn't return calls seeking comment on results from selling nonfood items. Starbucks, the largest U.S. chain of coffee shops, has enlarged its product selection for the holidays with gift sets including Ray Charles' "Genius Loves Company" and a gift card. Seattle-based Starbucks has generated almost 30 percent of the CD's sales in the United States since its August release. "This is the best-coordinated holiday program we have ever put together," said James Donald, who was promoted to be Starbucks' CEO starting in March. Dallas-based 7-Eleven Inc., the largest U.S. convenience- store chain, this month began selling video games including Microsoft Corp.'s "Halo 2," the sequel to the best-selling title for Xbox players, for $49.99. "We want to try to remove the constraints on the kind of traditional merchandising approach that says this box has to carry these products," said Kevin Elliott, vice president of merchandising. Petsmart, the largest pet-supplies retailer, expects to carry more than 1,000 holiday gifts, adding $12 collars with flashing green-and-red lights.